It will be the battle of The Ultimate Fighter winners at UFC 145. On Thursday evening, lightweight Mac Danzig (Season Six) announced on his Twitter account that he’ll battle Efrain Escudero (Season Eight) on March 24th in Montreal, Quebec, Canada. 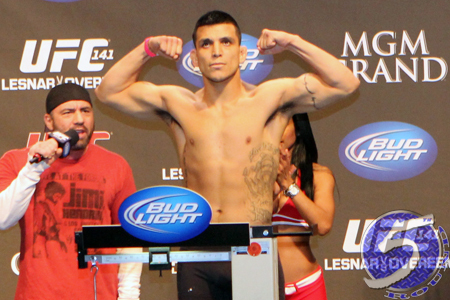 Escudero (Pictured) posted a disappointing decision loss to Jacob Volkmann last Friday at UFC 141. It was his first contest inside the Octagon since being fired in October 2010. Although a venue has not been announced for UFC 145, the trusty rumor mill claims the Bell Centre in Montreal is the front-runner to serve as host.